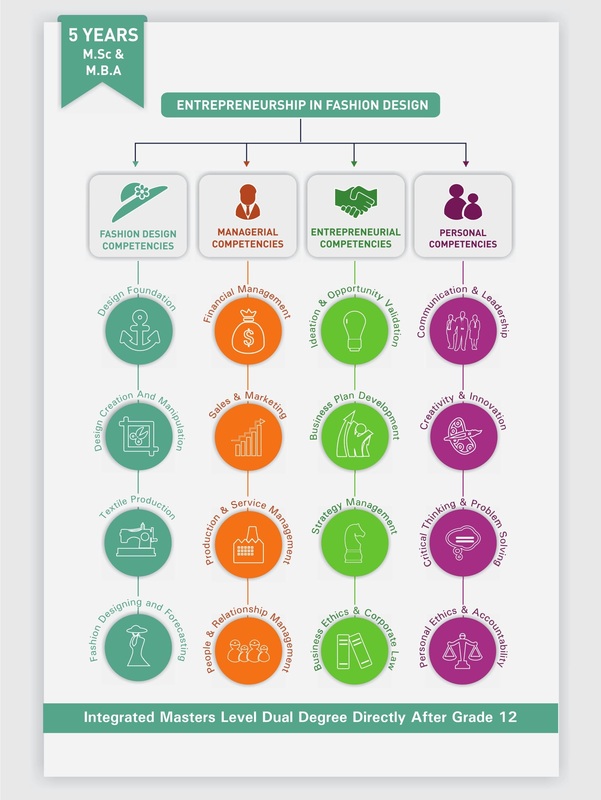 The TIPSGLOBAL's 5-Year integrated dual degree program for Entrepreneurship in Fashion Design is interdisciplinary in nature. Developed on a strong foundation of design sense and concepts, this program not only entails imagination and instinct for creativity but also involves independent research, conceptualization, application and artistic expression. The practice of fashion is taught as one's cultural embodiment within a social framework and learned through rigorous attention to craft, production and contemporary aesthetics. Students build a vision through conceptual processes emphasizing curiosity, imagination, improvisation and play. They communicate that vision through proficiency in illustration skills, fluency with materials, traditional methods and digital technologies. Built as a thorough program, the curriculum followed is designed to teach students the basics of business management, textile construction, fashion design and styling. In addition to challenging courses like Project Management, Entrepreneurship, Accounting, Finance, Business Ethics and Corporate Law.